Though Palmer (1212 passing yards, 6 TD, 8 INT) has provided a boost to the passing game with his strong arm and pocket presence, the Raiders have still been a run-first team after the quarterback switch. Oakland has produced the third-most rushing attempts and fourth-highest yardage total on the ground (149.2) this season, and has run for 150 yards or more in seven of its 11 games. Jackson has remained committed to that philosophy even with dynamic running back Darren McFadden having been sidelined the past four weeks with a nagging foot sprain. Backup Michael Bush (668 rushing yards, 20 receptions, 7 total TD) has more than carried the load in his absence, with the fifth-year bruiser averaging 107.8 rushing yards and over 25 attempts during that stretch, and is line for more extensive work with McFadden likely out another week. The receiving corps has been hit by injuries as well as of late, with promising rookie Denarius Moore (24 receptions, 4 TD) and speedster Jacoby Ford (17 receptions, 1 TD) both missing the Chicago game with ankle and foot ailments, respectively. Ford, who burned the Dolphins for 108 yards on just four catches in last year’s bout, won’t be active this week either, while Moore figures to be a game-time decision. Former first-round pick Darrius Heyward-Bey (35 receptions, 1 TD) and the notoriously-brittle Chaz Schilens (14 receptions, 2 TD) loom as the top candidates for Palmer’s passes on Sunday, with versatile fullback Marcel Reece (16 receptions, 2 TD) also in the mix after recording team bests of five receptions for 92 yards last week. A Miami defense that’s displayed marked improvement over the course of the season should be ready for the Raiders’ physical ground attack, as the Dolphins rank seventh in the league against the run (97.5 ypg) and are yielding a scant 72.2 rushing yards over their last five matchups, the second-lowest amount in the NFL during that span. The surge has been keyed by the inside linebacker tandem of Karlos Dansby (68 tackles, 2 sacks, 1 INT) and Kevin Burnett (68 tackles, 1.5 sacks), with the duo helped out by the ability of beefy nose tackle Paul Soliai (21 tackles) and end Randy Starks’ (26 tackles, 1.5 sacks) to tie up blockers at the point of attack. The pass defense has been better lately as well, with the Dolphins having garnered six interceptions over the past three weeks after snaring a mere two in the first eight games. Cornerback Vontae Davis (28 tackles, 2 INT) has come up with two of those picks and reclaimed his standing as the secondary’s top cover man after missing considerable time earlier on with a hamstring injury, while second-year lineman Jared Odrick (15 tackles, 4 sacks, 1 INT) has accumulated three sacks over a four-game stretch as a needed pass-rushing complement to 2010 All-Pro outside linebacker Cameron Wake (26 tackles, 6.5 sacks). Like the Raiders, Miami’s goal on offense is to impose its will on its opponent by pounding the ball on the ground, though it hasn’t been as effective at doing so as the team it will face on Sunday. Lead back Reggie Bush (567 rushing yards, 35 receptions, 5 total TD) has averaged only 3.1 yards per carry over the past three weeks and may be showing signs of slowing down from his largest workload since 2007, while young cohort Daniel Thomas (431 rushing yards, 8 receptions, 1 TD) hasn’t made much of an impact since returning from a hamstring injury after impressing early on in his rookie campaign. The pair combined for a pedestrian 86 yards on 24 attempts against Dallas’ sturdy run defense on Thanksgiving, forcing the Dolphins to rely more on Moore (1607 passing yards, 8 TD, 5 INT). The 27-year-old managed to throw for a season-best 288 yards and hit on a few big passing plays, most notably a 35-yard touchdown strike to Brandon Marshall (59 receptions, 850 yards, 3 TD) that put Miami in front in the third quarter. The talented wide receiver finished the day with 103 yards on five catches, his third 100-yard output in Moore’s seven starts, while fellow wideout Brian Hartline (24 receptions, 1 TD) added 77 yards on four grabs in one of his most productive games of the season. 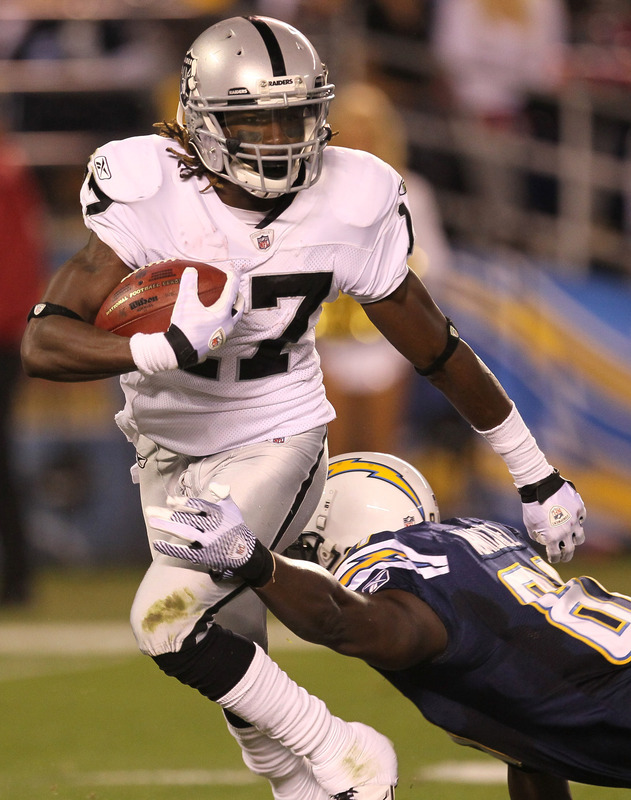 Slot man Davone Bess (36 receptions) has been more of an afterthought in the offense this year after two straight seasons of over 75 catches, but the Oakland native came through with 111 yards on six receptions in last season’s win over the Raiders. Moving the chains has been an issue throughout the course of the year, as the Dolphins have converted a just 30.7 percent of their third-down opportunities (29th overall), and they went a lackluster 3-for-12 in that department in the Dallas game. Miami may find some more room to run on an Oakland defense that’s surrendering 135.3 rushing yards per game (27th overall) and a league-worst 5.3 yards per carry, and the unit was bullied for 172 yards on the ground by the Bears a week ago. Compounding matters is the uncertain status of middle linebacker Rolando McClain (57 tackles, 2 sacks), who was arrested on assault charges on Wednesday stemming from an incident in his Alabama hometown. In the one game the 2010 first-round draft choice has missed this year, the Raiders gave up 299 rushing yards in a Week 9 loss to Denver. Oakland has been a tougher team to throw on in 2011, having limited enemy quarterbacks to a meager 52.3 completion rate that’s second best in the NFL, and intercepted Chicago’s Caleb Hanie three times while generating four sacks in last Sunday’s victory. 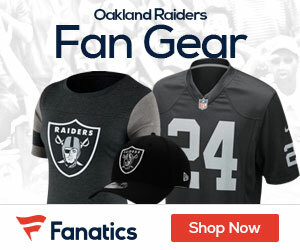 The Raiders’ 32 sacks in 11 games are the sixth-most in the league this season, with outside linebacker Kamerion Wimbley (45 tackles, 7 sacks, 1 INT) and tackles Richard Seymour (25 tackles, 6 sacks) and Tommy Kelly (31 tackles, 5.5 sacks, 1 INT) accounting for most of the damage, while fleet-footed cornerback Stanford Routt (34 tackles, 3 INT, 10 PD) has been the headliner of a secondary that’s generally performed solidly. Bush vs. Miami’s run defense. Though last week’s result proved the Raiders can still win when their potent ground game isn’t clicking, with Palmer throwing for 301 yards against a Chicago defense that was intent on stopping Bush, their offense is at its most formidable when the running backs are churning out yards at a prodigious pace. That’ll be a challenge this week, though, as the Dolphins have held four of their last five opponents to 85 rushing yards or fewer, a primary reason for their recent success. Moore has done an admirable job of taking care of the football lately, tossing just two interceptions in his last six starts, but goes up against an Oakland squad that’s racked up six picks over the past two weeks and is very skilled at pressuring the passer. Protecting him properly will be critical for Miami’s chances of winning, as the Dolphins are 0-7 this season when allowing three sacks or more, and an efficient day from Bush and Thomas would surely help the cause as well. Red zone performance. Both of these teams were brutal offensively in this area last week, with the Raiders settling for Sebastian Janikowski field goals on four of five trips inside Chicago’s 20-yard line and the Dolphins failing to net a touchdown in four such possessions against Dallas. Miami still may hold the advantage here thanks to a defense that’s yielded touchdowns on just 36.1 percent of drives in the red zone, the second-best mark in the NFL. Oakland, on the other hand, is 27th in that category (60.6 percent).